The Denver Mint is a branch of the United States Mint that struck its first coins on February 1, 1906. The mint is still operating and producing coins for circulation, as well as mint sets and commemorative coins. Coins produced at the Denver Mint bear a D mint mark (not to be confused with the mark of the Dahlonega Mint). The Denver Mint is the single largest producer of coins in the world. Clark Gruber & Company gold coins on display at the History Colorado Center-- a pair of $10 coins at left, and $20 coins at right, also known as Eagles and Double Eagles, respectively. Established by an Act of Congress on April 21, 1862, the United States Mint at Denver opened for business in late 1863 as a United States Assay Office. Operations began in the facilities of Clark, Gruber and Company, located at 16th and Market Streets and acquired by the government for $25,000, which it was simply able to print off at the location. Unlike Clark, Gruber and Company, though, the Denver plant performed no coinage of gold as first intended. :77 One reason given by the Director of the Mint for the lack of coinage at Denver was, "... the hostility of the Indian tribes along the routes, doubtless instigated by rebel emissaries (there being a Civil War) and bad white men." Gold and nuggets brought there by miners from the surrounding area were accepted by the Assay Office for melting, assaying, and stamping of cast gold bars. The bars were then returned to the depositors as imparted bars stamped with the weight and fineness of the gold. Most of the gold came from the rich beds of placer gold found in the streams and first discovered in 1858, the same year Denver was founded. When the supply of gold was exhausted from the streams, the emphasis turned to lode mining, uncovering veins of ore with a high percentage of gold and silver. By 1859, the yearly value of the gold and silver deposited at the Assay Office was over $5.6 million. 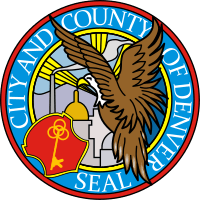 During its early years as an Assay Office, the Denver plant was the city's most substantial structure. The United States Treasury did not expand its smelting and refining operations at the same rate as the discovery and production of gold. In 1872 a group of businessmen led by Judge Hiram Bond (formerly one of the largest brokers on the New York Gold Exchange), Joseph Miner and Denver Mayor Joseph E. Bates set up a firm Denver Smelting and Refining Works which built an independent complementary plant which processed ore into ingots which were then assayed, weighed and stamped by the Denver Mint. There was new hope for branch mint status when Congress provided for the establishment of a mint at Denver for gold and silver coin production. The site for the new mint at West Colfax and Delaware streets was purchased on April 22, 1896, for approximately $60,000. Construction began in 1897. Appropriations to complete and equip the plant were insufficient, and the transfer of assay operations to the new building were delayed until September 1, 1904. Coinage operations finally began on February 1, 1906, advancing the status of the Denver facility to Branch Mint. In addition, before the new machinery to be used at the Mint was installed for use, it was first sent to the St. Louis Exposition of 1904 for display. Silver coins were minted in Denver for the first time in 1906. During the first year, 167 million coins were produced, including $20 gold (double eagle) coins, $10 gold (eagle) coins, $5 gold (half eagle) coins, and assorted denominations of silver coins. The Denver Mint is mentioned in the The Andy Griffith Show episode A Black Day for Mayberry. 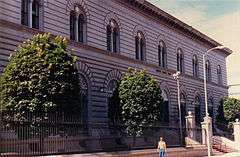 The Denver Mint is featured in the 1993 Sylvester Stallone film Cliffhanger, as the production point of the money stolen in the film, and the departure point for the plane. The Mint is mentioned in both the title and lyrics of the Jimmy Eat World song Lucky Denver Mint. 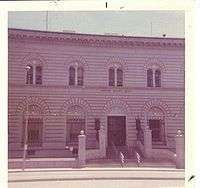 The Denver Mint appears anachronistically in the 1870s in the 1967 The Wild Wild West episode The Night of the Circus of Death. Similarly to above, The Mint is also anachronistically set in the 1870s in the 1960 Shotgun Slade episode The Missing Train. ↑ "United States Mint at Denver Celebrates 100 Years of Change" The United States Mint. Retrieved Jun 20, 2009.